A grand vision, a glorious statement. In 1824 prosperous gunsmith and local worthy Asa Waters II set out to build the stateliest residence in the country. It took two full years to amass the necessary materials for what is now known as the Asa Waters Mansion and Mr. Waters spared no expense: hard pine from the southern United States, marble from Italy, mahogany from Central America, bricks from Baltimore, Maryland, "pumpkin pine" from Maine, and more, all had to be brought to the site from the Boston ports by horse and wagon. At this time there was noBlackstone Canal or railroad to facilitate transport of such fine goods to Central Massachusetts, but Mr. Waters was determined to realize his grand vision of a home that would stand as the brightest jewel in town and a testament to his success. Asa Waters II was born in 1769 in the section of Sutton, Massachusetts which later incorporated as Millbury in 1813. He learned the art of gun-smithing in his father Asa Waters I's shop, and in 1808 the junior Asa and his brother Elijah opened the Waters & Co. Armory along the banks of the Blackstone River, in what is now Millbury Center. Following the untimely death of Elijah in 1814, Asa Waters II carried on the business solo, patenting several gun manufacturing inventions, partnering with inventor Thomas Blanchard and utilizing Blanchard's cam-motion and lathe technologies, and securing lucrative arms contracts with the United States government. Under Asa Waters II's innovative leadership, Waters & Co. prospered, and, by 1824 Mr. Waters was poised to make a glorious statement about the success of his business empire: that statement was the Asa Waters Mansion. Where history and beauty meet. Historians credit acclaimed Boston-based architects Alexander Parris and Asher Benjamin for the house's design. In addition, master builder on the project Captain Lewis Bigelow also may have contributed to the final plans and ornamental design details. 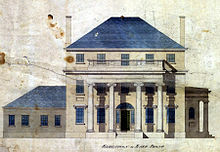 Ground broke on the Asa Waters Mansion in 1826 and the Waters family took up residence in 1829. Mr. Waters deliberately commissioned a home with multiple reception spaces that would be well-suited to entertaining, and the family celebrated the official housewarming with a grand Christmas Eve Ball in 1832. Upon Asa Waters II's death in 1841, the house went to his only son, Asa Holman Waters (also known as Asa Waters III). Asa Holman Waters grew to become an ardent abolitionist and member of the abolitionist Free Soil Party. While Waters & Co. closed in 1845, Mr. Holman Waters briefly reopened the armory during the Civil War, when the US government commissioned munitions parts for the Union Army, and local lore suggests that the Asa Waters Mansion may have served as a stop on the Underground Railroad during this time. The Mansion remained in the hands of the Waters family until 1929, when it was sold to the Roman Catholic Diocese of Worcester for use as the Rectory of nearby St. Brigid's Church. In 1956 the Mansion was then converted into a novitiate for the Sisters of Our Lady of Mercy, and then changed hands again within the Church in 1967 when the Diocese utilized the residence for the Bishop of Worcester, MA. In 1977 the Town of Millbury acquired the Asa Waters Mansion, and in the subsequent years the old house took on a variety of municipal residents, including the District Nursing Society and the Millbury Historical Society. By 1994, the Asa Waters Mansion had fallen into quite a bit of disrepair. It was at this time that the once grand residence found itself in serious peril. Architectural rendering of the house. The Asa Waters Mansion today. A home in peril, a legacy preserved. With the house crumbling and the Town unsure about what to do with its once-bright jewel, 1994 was a dark year for the Asa Waters Mansion. When it was proposed that the Town tear down the house to make room for a parking lot, all seemed lost for Mr. Waters' glorious statement. It was then that a group of concerned citizens formed the Asa Waters Task Force and petitioned to save the house: funds were raised, tradesmen in the community donated materials and labor, and the Friends of the Asa Waters Mansion preservation society was formed. 1995 saw a change in the house's fortunes and a glorious restoration was begun. Because of a dedicated band of concerned citizens who refused to see this lovely piece of history destroyed, we are all able to delight in Asa Water's glorious vision to this day. The Asa Waters Mansion regularly opens its doors for community events and is one of New England's premier event venues. At any given time of the year, its halls ring with music and laughter, community and camaraderie. It is with great pride that we at the Asa Waters Mansion welcome one and all to celebrate life's most special days within its keep, and we are committed to upholding Mr. Waters' desire that this grand residence be the shining jewel of the Millbury community. Friend of the Asa Waters Mansion or make a secure , tax-deductible donation to our Preservation Fund.